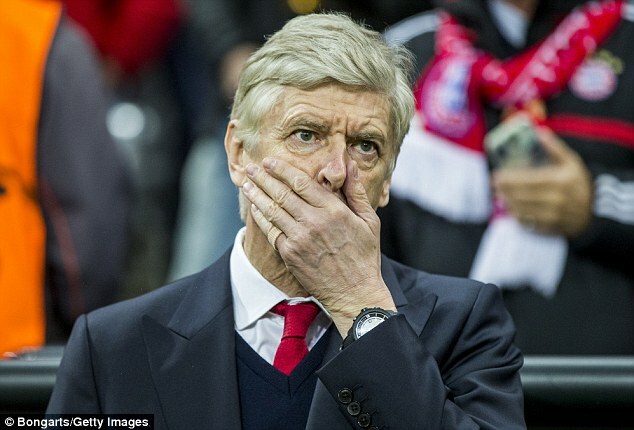 Arsene Wenger insisted that Arsenal remain up for the huge challenge against Bayern Munich in the Champions League. The gunners are once again set for a difficult opponent in the last 16 stage of the competition. In the last few years, they have faced such tough opposition largely as a result of finishing second in the group. This time around, the club have been unlucky to come up against the Bavarian giants despite finishing top of the group. Arsenal come into the game under a lot of pressure as a result of falling 10 points behind Chelsea in the Premier League. A ninetieth minute own goal from Mathieu Flamini gave Swansea City a share of the spoils at the Emirates Stadium yesterday evening, further denting Arsenal’s hopes of clinching the title. The visitors took the lead on eleven minutes through Wilfried Bony, though two quick fire second-half goals from Lukas Podolski and Olivier Giroud turned the game on its head. Arsenal midfielder Mathieu Flamini has heaped praise on Arsene Wenger ahead of his 1000th game in charge of the club, the Daily Star understands. The Gunners’ boss, whose first match was a 2-0 win over Blackburn Rovers on October 12th, 1996 will reach the landmark at Stamford Bridge on Saturday afternoon, when his side take on league leaders Chelsea, and Flamini has hailed the achievement as ‘unbelievable’, before congratulating the man who re-signed him from AC Milan last summer. Meanwhile, the Mirror understand that the club are considering a move for Toulouse full-back Serge Aurier as they continue to search for a replacement for Bacary Sagna, who is expected to leave the club at the end of the season. The Ivory Coast international has made twenty-five Ligue 1 appearances so far this season, scoring five goals, and is valued at around £6m. However, an alternative option could be Southampton prospect Callum Chambers, according to the Independent. The 19 year old is the latest in a long line of graduates from the Saints famed academy to have broken into the first team, appearing in seventeen league games so far this season. Gunners duo Theo Walcott and Alex Oxlade-Chamberlain both cut their teeth in the South Coast side’s youth set up before securing big money moves to the Emirates. Thomas Vermaelen’s agent Alex Kroes has revealed that the defender has told Arsene Wenger that he wants to leave the club at the end of the season, according to the Metro. The 28 year old has failed to hold down a first team place with the Gunners this season due to the continued form of Laurent Koscielny and Per Metersacker. Arsenal go into Sunday’s match against a resurgent Crystal Palace hoping to take the three points that will see them return to the top of the Premier League. With leaders Manchester City not playing their match against third place Chelsea until Monday, Arsene Wenger’s men have the opportunity to take back first place, which they surrendered by dropping two points against Southampton in midweek. Premier League leaders Arsenal dropped points in the title race after being held to a 2-2 draw at Southampton yesterday evening. The south coast club took their lead on twenty-one minutes through Jose Fonte, though two goals in four minutes early in the second half from Olivier Giroud and Santi Cazorla handed Arsene Wenger’s men the advantage. However, the Gunners lead was short lived as Saints captain Adam Lallana fired in to draw level, and give Mauricio Pochettino’s men a share of the spoils. Matthieu Flamini was shown a straight red card for a two-footed challenge on fellow Frenchman Morgan Schneiderlin with ten minutes on the clock, and will now miss the forthcoming matches against Crystal Palace, Liverpool and Manchester United. Arsenal are now just two points clear of second place Manchester City, who along with Chelsea could move above them this evening. City travel to Tottenham Hotspur and Chelsea host West Ham United, so any of the three could end the day in top spot. Elsewhere yesterday, fourth place Liverpool thumped Everton 4-0 in the 222nd Merseyside derby, while champions Manchester United beat Cardiff City 2-0, with former Gunner Robin van Persie scoring on his return from injury. An inspired performance from Aaron Ramsey led Arsenal to a 3-0 victory over the Welshman’s former club Cardiff City on Saturday afternoon, and strengthened the Gunners’ grip on top spot in the Premier League in the process. The club’s top scorer this season struck first on twenty-nine minutes, converting Mesut Ozil’s cross, before the German international fed Mathieu Flamini, who doubled their advantage with his first goal since returning to the club four minutes from time. Mathieu Flamini is set to return to the Arsenal line up to face former club Marseille in tonight’s Champions League group F clash. The France international missed Saturday’s Premier League win over Southampton through suspension after amassing five yellow cards, but could feature at the Emirates Stadium. Arsenal will leave it late before deciding if Jack Wilshere is fit enough to face Manchester United at Old Trafford on Sunday afternoon. The England international missed the recent victories over Liverpool and Borussia Dortmund with an ankle injury, but may recover in time to play at least some part.